Read How to save power in these candid testimonials about the real savings people are making everyday with the Power Save 1200. Bob Kleebauer has realized extraordinary savings using his Power-Save 1200 energy saver. "On March 24th, 2006 I had a Power Save 1200 installed on my circuit panel in my Baltimore Maryland home. My home is about 2200 Square feet and is a townhouse. My February/March utility bill used 1542 Kwh. My March/April bill had 1272 Kwh usage, and although I only had the Power Save 1200 on my circuit panel for 19 days in the March/April billing period, I used 270 less Kwh that month. Then, the next billing period really told the tale. The April/May bill only had 1002 Kwh usage, and I ran the A/C a couple of days that reached the 80's outside. In July our electric rates are going to 11.871 cents per Kwh so I estimate that I'm saving about $47.00 a month, which pays for the Power Save in about 7.9 months. It made a believer out of me, and it can do the same for everyone. I am in the energy business, and I have seen prices rise 600% for natural gas in the past 9 years. This product is a real winner." "My June/July 06 bill reflects the following. In June/July 05, I was averaging 62 Kwh per day. On my most current bill, June/July 06, I am only averaging 48.7 Kwh per day. At .1050 cents per Kwh, I am saving $1.40 a day, times 30 days = $42 a month in savings!" CHARLES COKER SAVES 33% ON ELECTRIC BILL! I purchased the power save on 6/3/08 and installed it 6/5/08. My energy usage from 6/2/07 -7/2/07 was 1950 kWh. My energy usage from 6/2/08- 7/2/08 was 1320 kWh. That's a reduction of 33%. This was acheived by changing all light bulbs with cfl and an installation of the Power-Save 1200. Thanks! Oh, by the way I tracked the temps from last year here in Mesa, AZ and it was 2 degrees hotter on average over the month. Again...WOW! Charles Coker Mesa, Arizona (average temp. 104)! "I purchased a PS1200 in early June (2006) and installed it as soon as it arrived on June 10th, 2006. As you know, the electric rates in Maryland have gone up significantly since July 1st . I recently received my electric bill and compared it to my bill from June/July of 2005. I discovered a savings of 827 kwh, a 24.45% decrease over the same time period last year. This unit is wonderful; only wish I knew about it earlier...Thanks again!!" "Last month I saved almost 25% off my electric bill using your PS1200 unit. This month (July/Aug 2006) I have saved just over 20%. The electric company (BG&E of Maryland) has lowered my budget billing amount from $354 to $320 per month starting in September. My PS1200 should pay for itself within four months at the current rate of savings. Thank you so much for this wonderful invention." "I have written to you on two separate occasions praising the PS1200 unit I installed on June 10th of this year. I just received my third electric bill since installing it and calculated a saving this month of $233.77 (1642 kWh saved). My total saving for 3 months has been $419. This unit is amazing." LARRY MODIN LOWERS ELECTRICAL USAGE BY 22%! We received the following testimonial on July 18, 2008... I had the Power-Save 1200 installed in January '08. The first 5 full months of use resulted in a 22% reduction of KWH used from prior year. With the savings on my electric bill, about 33%, I have all ready recouped the cost!!! PowerSave 3400 Produces Incredible Savings In A Commercial Business! "I have a Power-Save 3400 commercial / industrial unit installed in my 28,000 square foot, 4-story office building. The building is home to a number of different professional offices including attorneys, engineers and the United States military. I am seeing an average savings of at least 28% per month and I am very happy with the product. Extremely happy actually. As an example, prior to the installation of the Power-Save, my April 2006 electric bill was just over $2700.00. I just received my April 2007 bill in the amount of $1780.00. The product will literally pay for itself in only a few months." While I was testing the unit, I had my friends present. I tested the product on the load side, and I found no difference in the amperage draw to my A/C unit on the circuit conductors directly from the breaker to it. At first, I was disgruntled. After settling down and thinking about what I had just done, I realized my error and clamped my Fluke meter on the mains directly behind the meter registering current draw at the line side of the load center....and BINGO!!!! On start up, the A/C unit went up to 91 amps and leveled out at 13 without the Power-Save 1200 on. When the Power Save unit was engaged it was a draw of 35 amps and leveled out at 8.75. That pretty much blew everyone away! After that, I tested everything with a motor load in my house. I was astonished at the significant reduction in amperage. I have had, in addition, a lot of customers complaining of bad power spikes, sags, and all kinds of irregularities from their utilities which could benefit from the unit." VANCE MOORE SAVES LOWERS ELECTRICAL USAGE BY 31%! Vance Moore of Illinois just faxed to us the usage comparison portion of his electric bill for both his residence and his business. The savings he has achieved since installing the Power-Save 1200 and Power-Save 3200 respectively is nothing short of incredible, with a savings at his laundromat in excess of 31% in May of 2008! Vance also realized a savings of over 22% at his residence in February and 17% in June! "I am achieving well over the projected savings of 25% and I am confident this will continue into the future...if every household in America had a Power-Save 1200 installed ...there would be enough electrical energy saved to eliminate any shortage for the next 5 years." Robert Milligan Jr., Bluffton, SC. "My first month savings was as an astounding 18%! I just had to write you..."
"I installed my Power-Save 1200 in March 2006, and my savings were immediate. My first full month of usage, year over year savings were fantastic. I went from an average daily usage of 80 kWh to 55 kWh, and my bill went from $172.80 to $117.32! With this savings my Power-Save 1200 will pay for itself in 6 months." "I just got my first electric bill with the Power-Save installed and I used 7.5 kilowatts less this month than the same month last year. Works out to about $300 per year. Thanks and have a great day." "My first bill with Power Save installed for a full month shows $104 in savings!, 790 less Kwh compared to last year!" "My Power Saver was installed on 8/4/06. I get an electric bill with a meter reading every two months, the first of which after the PS installation was on 9/20. It showed 456 KWH for 30 days, average daily cost (adc) $1.18 compared to 577 for 32 days, adc $1.31 in the same period, 2005. The next reading was on 11/21 and showed 246 KWH for 33 days, adc $0.65 compared to 463 for 30 days, adc $1.16 in the same period, 2005. Customer Saves 20% On Electric Bill! 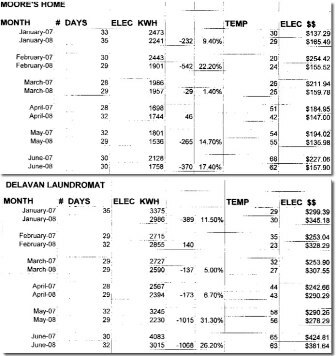 David Bollinger recently sent us a screen shot (see below) of his December 2007 electric bill and the information is remarkable to say the least. 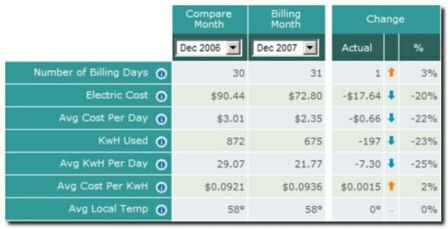 Despite the fact that the billing cycle was one day longer and the cost per KwH slightly more expensive, Bollinger saved a full 20% on his electric bill (see the usage comparisons for 2006 and 2007)! We thank David for the update and are pleased to see that he is receiving such a significant return on his investment! NEW CUSTOMER SAVES 20% WITH POWER-SAVE 1200! "Well I just got my first bill from the power company. I saved 20% on my bill thanks to that little box called 'Power-Save 1200'. So, I am sending you a copy of my bill for you to use if you wish. I want to just say I have been in sales for over 30 years and it's real nice when you can stand behind the product without any second thoughts or concerns. I'm looking forward to a fruitful relationship." Return from how to save power to Powersave 1200. Return from save power to solar energy scene home.